When it's one-of-a-kind, you just know. 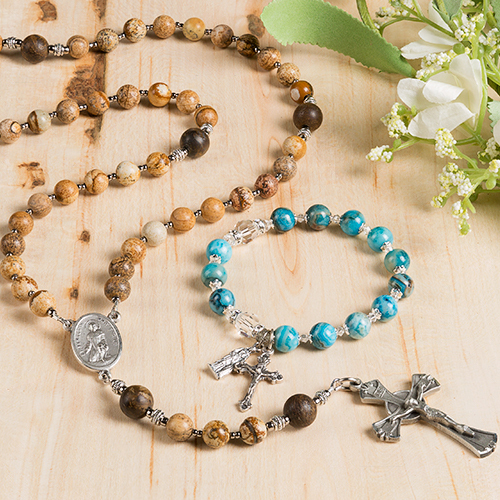 This Mother Teresa rosary was designed and handmade exclusively at The Catholic Company. Chosen for their simplicity and subtle detailing, and capturing the colors of Mother Teresa's sari, these azure jasper beads are complemented by creamy riverstone Our Father beads to make an exquisite rosary, worthy of this remarkable woman. A beautiful, yet simple crucifix is paired with an exclusive Saint Mother Teresa Medal, featuring an etching of extraordinary likeness which captures the weathered, tell-tale lines of unconditional love. 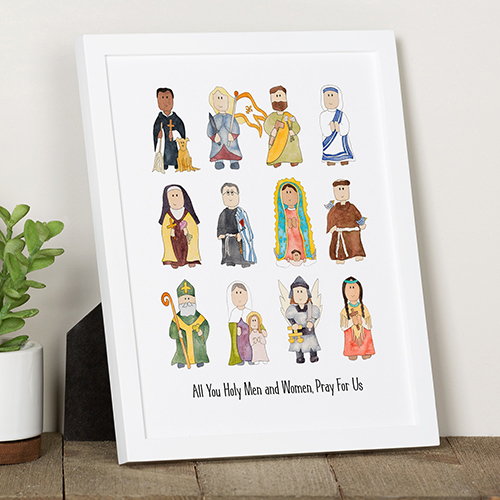 Accompanied by a prayer card featuring the 20 mysteries of the rosary and which days to pray them. This Saint Mother Teresa rosary serves as a reminder of the quiet dignity of this incredibly generous, and loving servant of Christ. 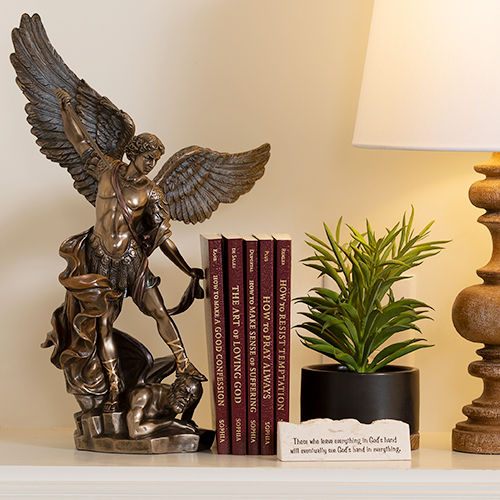 Looks and feels like fine jewelry, yet this devotional is a humble reflection of the gift of prayer and meditation as it invites you to listen to the voice of God. I have been wanting a Rosary like this for a long time. With May being the month of the Rosary I ordered it and today it came in. 4-26-2018. Unbelievable Rosary pictures do not do it justice. Using it today will have it blessed by Father tomorrow. I am a new Catholic,and she is my confirmation saint. I purchased the bracelet version, and decided to buy the full rosary. It is very well made. I expect it will last a long time. I recently ordered this rosary for my wife. This is such a meaningful rosary. I corresponded with Mother Teresa over the last 12 years of her life and my wife got a letter from Mother just a couple of months before her death. This rosary does justice to a Saint and brought us both to tears. Ten stars would not be enough. 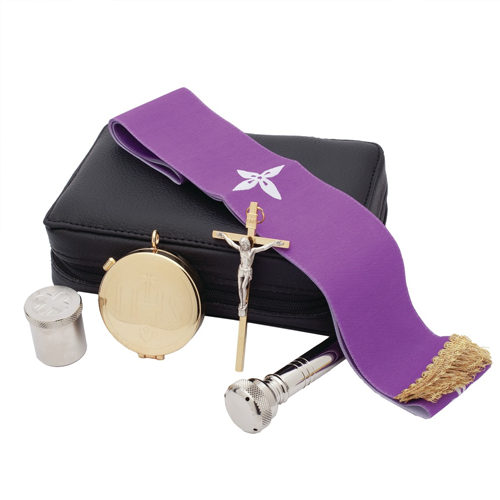 Thank you Catholic Company for your prompt, professional and prayerful service! This rosary is exquisite. Its beauty and quality are beyond words!!! And what a wonderful way to honor such a dedicated loving woman of Christ. Beautiful gift from my husband, I love the designed and high quality. Just a lovely rosary. I love holding it in my hands while I pray. Well-made and lovely colors. Beautiful rosary. Love praying with it. It's a wonderful size and would highly recommend purchasing it. I love the look of the rosary. 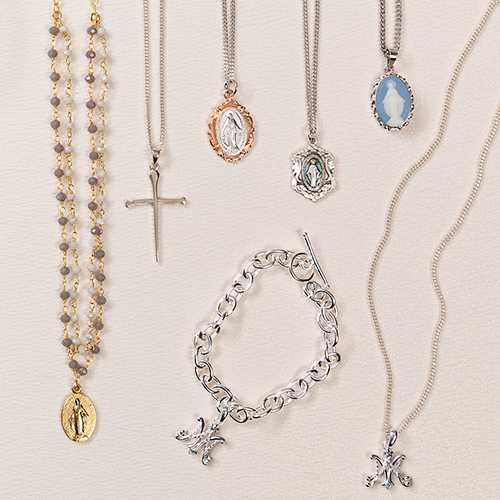 The beads are beautiful and the crucifix is also beautiful. I took away 2 stars because the beads are so so very close together. I am used to having a bit of room between each bead. On this lovely item there is hardly any space at all between the beads at all. 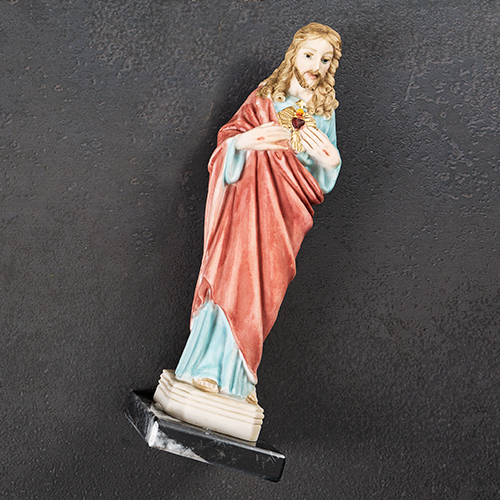 It makes it hard to keep your place when saying the Hail Marys. Received the three rosaries that I ordered and they are stunningly beautiful. They are among my most favorite gifts that I've purchased for Christmas, for my precious children. Thank you! When I received my package and I opened it, wow was totally elated with my purchase. The Saint Mother Teresa Rosary is absolutely beautiful. 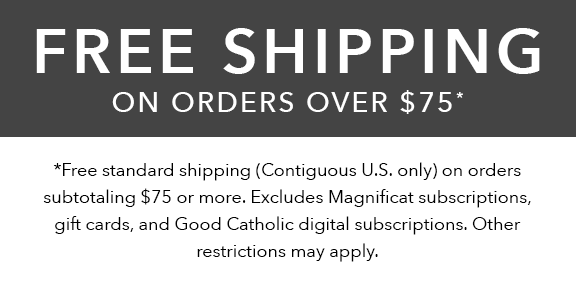 I highly recommend to all to purchase this rosary to honor two beautiful ladies, Mary the mother of Jesus and St.Teresa for her total commitment to the poor and needy. Excellent item. My wife loves it. When I saw this rosary and the matching bracelet, it touched me in a very special way. Because of the price, I bought the bracelet and loved it so much but could not stop looking at the rosary. I just received it and, like the bracelet, it is not easy to say just exactly what it is that makes these pieces so special. I love the medal of St. Mother Teresa and the colors. Perhaps like Mother, it captures the beauty of her spirit. So very beautiful. 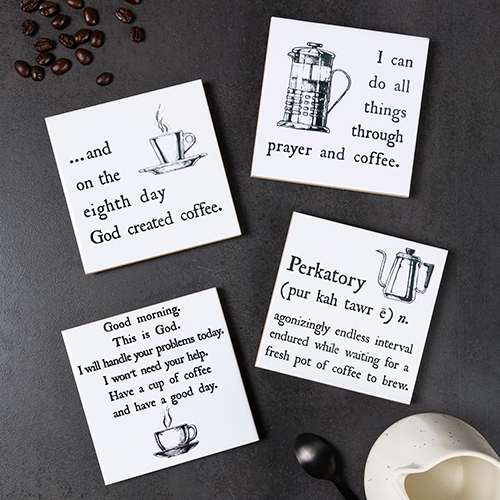 Just ordered 2 more for wedding gifts:. I had the back of cross engraved with bride and groom names. I love this rosary. It is beautiful. However, I have not yet received the remainder of my order. Please notify as to when I will receive it. I purchased this amazing rosary as gift for my son who has always admired Mother Teresa and another for a door prize for our parish Altar Society. Everyone wanted to win it! Our parish principal loved it too so we bought one for her. It is not only gorgeous it is very well constructed. I particularly love the St. Teresa medal. Absolutely love this rosary and I hope to order one for myself soon! What a beautiful reminder of Saint Mother Teresa and the many blessings she taught us all. 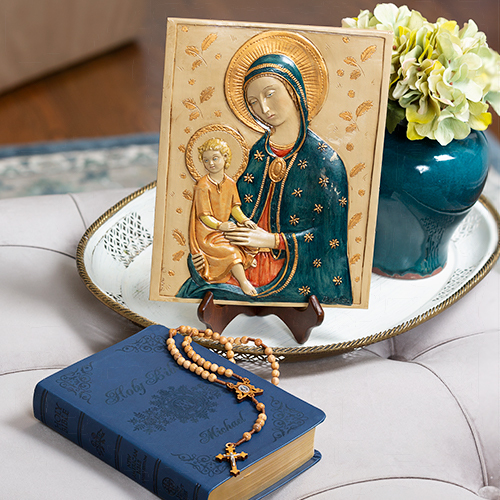 The Special Edition Saint Mother Teresa Rosary is a treasure to own and pray with. The beads of the rosary are just the right size for adult hands and the natural blue agate stones are especially beautiful. The rosary is very well constructed and should last a lifetime. I highly recommend this sacramental as either a gift for a very special loved one or for your own devotional use. Incredibly beautful and well made. Who can ask for more? Saint Mother Teresa Rosaries are more beautiful than I imagined! These will bring so many blessings to celebrate my daughter's high school graduation. God Bless. I WANT TO SAY THIS IS THE MOST BEAUTIFUL ROSARY I EVER SAW. I love the Mother Teresa Rosary! They are well worth the money. Top quality! I want to order another one for a gift! I purchased two of these Rosaries for my Wife and Sister in Law. They are gorgeous. Well made. I am very happy with them. Come Christmas, I will know if they like them as much as I do. Thank you for this rosary. It is absolutely stunning. The blue beads remind me of Saint Mother Teresa's grace as she ministered to the poor. It gives me a feeling of peace every Saturday evening when we pray the rosary at our parish before the anticipated Mass. I already have 3 rosary beads and love them, however it's such a joy also having this Mother Teresa specially designed rosary beads - they're beautiful, with obvious quality, but most of all with Mother Teresa's picture and my initials, they're such an inspirational and personal treasure for me. I am so pleased with this. It is special in every way. What an absolutely beautiful rosary! It makes prayer such a pleasure. The stones are beautiful, and the small medal of St. Teresa is perfect! Lovely rosary which I will treasure both as a reminder of the canonization of St. Teresa of Calcutta and as a beautiful devotional aide. I purchased this rosary. It is a beautiful rosary. It is weighty, yet easy to finger. A beautiful image of Saint Teresa on the centerpiece. Great quality in the making of this piece. I will treasure it always.. Mother Teresa is one my favorites. I strongly recommend her rosary to anyone. Its a well made product, craftsmanship is fantastic. A wonderful, well made and beautifully colored pair of rosaries! I think Mother Theresa would be proud of them and all of us who are praying them!!!!! The colors, size and weight are perfect. 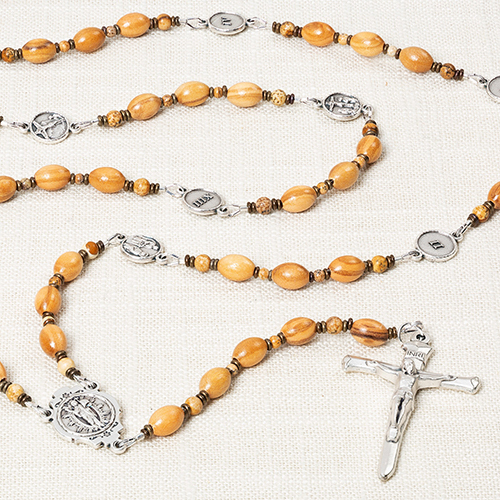 This rosary reflects the beauty of Mother Teresa with grace, style and elegance. It is now my most cherished rosary.